Do you know what the various parts of an AQL table mean? In this blog post, we'll walk you through step-by-step how to use the AQL table for product inspection! 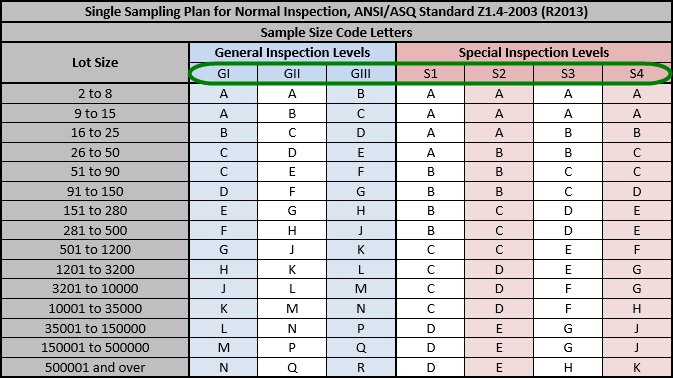 Would you be able to determine the right sample size for inspecting your product, using only an industry-standard AQL table? What about the maximum number of defects allowed to accept the order based on AQL standards? It’s no secret to most importers that product inspection is a vital process for determining if a shipment of goods meets their expectations. But many importers don’t understand the sampling methods QC professionals use for inspecting their products. You might see an AQL chart and not know what various parts of the chart mean or how to use them. Or maybe you don’t know how to interpret the AQL results shown in your inspection report. You could use a simple AQL calculator to get the information you need quickly. 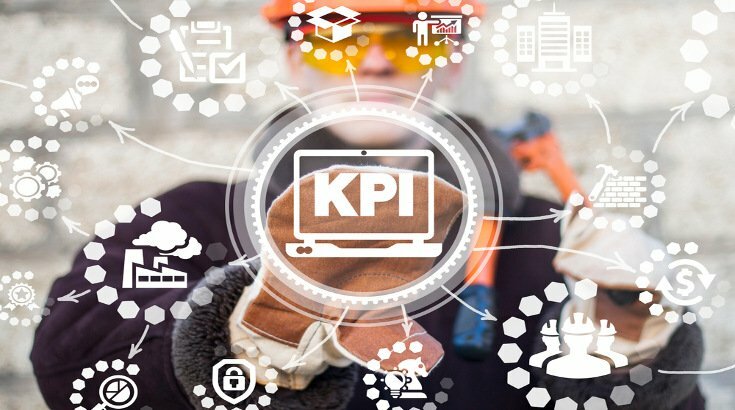 But understanding how the table works can go a long way in helping you interpret your inspection results and decide how to act on them. So let’s jump into the step-by-step process for using the AQL table for QC inspection (related: The Importer's Guide to Managing Product Quality with AQL [eBook]). Several acceptance sampling standards have come and gone over the years since the U.S. military first adopted sampling procedures during World War II. 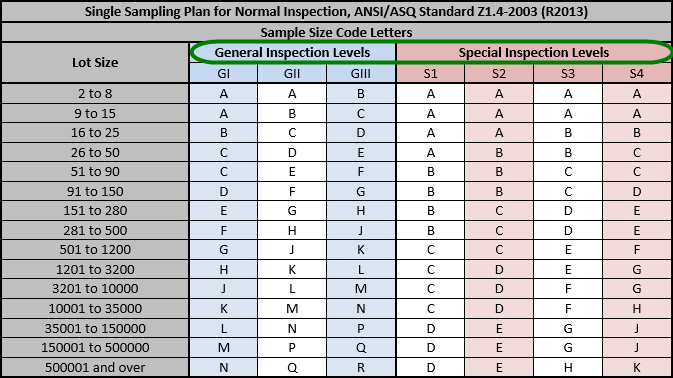 Most QC inspectors today use the ANSI ASQ Z1.4 standard AQL table, and that’s the one we’ll focus on here. This chart will help you decide how many units to pull randomly from your total order quantity for inspection and the maximum number of defects to accept in the finished goods. Your inspection type will be either “general” or “special” shown in the two columns on the first part of the table. You’ll most likely want to use general, as this represents the main sample size you’ll be using for inspection. The special inspection type is reserved for particular types of product testing and other checks that you need only perform on a smaller portion of your order. A number of inspection levels divide each inspection type. The columns further to the left include higher inspection levels representing a larger scope and contributing to a larger sample size. Most inspections of the general type, for example, will fall under “GII”, which is the most popular. Importers requiring a less thorough inspection and those with a relatively tight inspection budget may choose “GI” for a smaller inspection sample size. More quality-conscious importers may select “GIII” for a larger sample size. Your lot size is the quantity of each stock keeping unit (SKU), or item, in your order. You might consider combining similar SKUs and inspecting these together, since inspecting more SKUs separately can greatly increase the time needed and cost for inspection. Let’s say you’re using AQL to inspect 3,000 watches you’re buying from a factory in Yiwu, China. There are five different SKUs in the order, but since they only differ in color, you’ve chosen to combine the SKUs and inspect them as one. Find your lot size among the ranges shown in the “lot size” column—“1201 to 3200”. 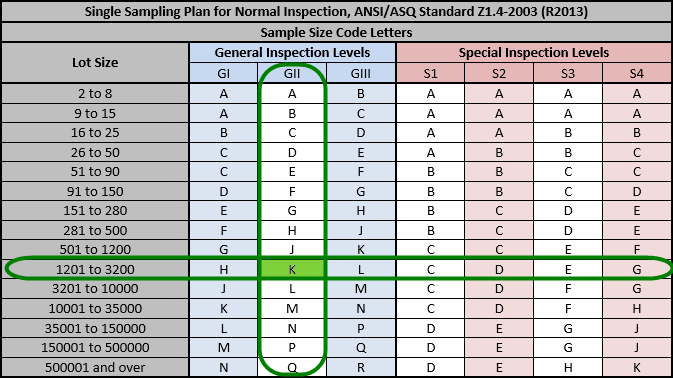 Assuming you’ve chosen the general inspection level GII, you’ll find that the letter “K” appears where your lot size row and inspection level column meet. This is your “sample size code letter”, which represents a sample size in another part of the AQL chart. You’ll use this in combination with your acceptable quality level to determine how many units to pull for inspection. On the second part of the AQL chart, you’ll find acceptable quality levels (AQL) at the top and sample size code letters along the left side. You can clearly see that your sample size code letter K corresponds to a sample size of 125 units. But what about your AQL? Your AQL represents your relative tolerance for quality defects, the worst average percentage or ratio of defects that is acceptable. Higher AQLs represent higher tolerances. That’s not to say that you should aim for having some defective units in your order. Rather, you should set a limit for how many defects you’re willing to accept in an order. That’s why some professionals have started using the term acceptable quality limit in lieu of the original term acceptable quality level. 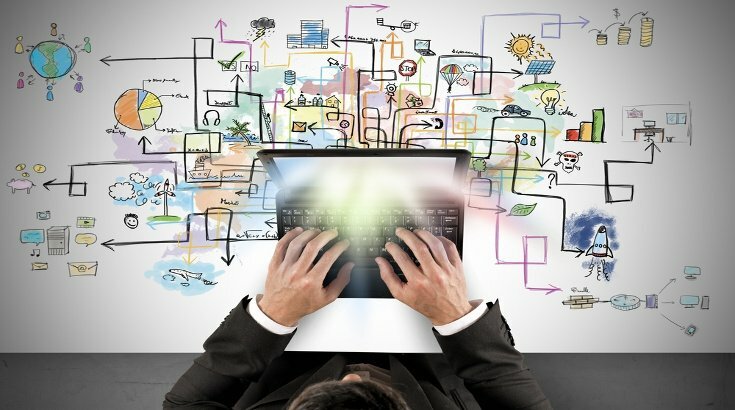 If you’ve classified your quality defects as “critical”, “major” or “minor”, you’ll typically use a unique AQL for each type (related: 3 Types of Quality Defects in Different Products). In this example, let’s use an AQL of 0 percent, 2.5 percent and 4 percent for critical, major and minor defects, respectively. Each AQL column splits into two more columns, “Ac” and “Re”. These are your accept and reject points. If you find a quantity of defects greater than your accept point, you should reject the order based on your chosen AQL. When we look below the AQL of 4 percent, we can see that the accept and reject points corresponding to your sample size row of 125 units are 10 and 11 defects, respectively. This means that if you find 11 minor defects or more in your sample, you should reject the order. Sometimes you may find an arrow pointing up or down in place of accept and rejects points when matching your original sample size with your chosen AQL. An arrow pointing down shows that a greater sample size is needed than you first calculated based on your lot size. An arrow pointing up shows that your original lot size is excessive at that AQL, and a smaller sample size is adequate. For example, if your AQL is a relateively strict 0.065 percent, your original sample size of 125 units is inadequate. You’ll need to follow the arrow on the chart pointing down to the next accept and reject points, 0 units and 1 unit, coupled with the next largest sample size, 200 units. This is the smallest sample size you can pull that that will be statistically significant enough to determine whether defects are, on average, within your limit. Many inspectors use the largest sample size found among the three defect types for all three, rather than pulling a different quantity of units to check for critical, major and minor defects separately. The procedure for conducting QC inspection can vary considerably between different importers and different product types and is outside the scope of this article. But how to pull a representative sample of goods for inspection is generally a consistent process that’s closely related to AQL. You must ensure that QC staff pull a truly representative sample for inspection in order to make a reasonable determination about your order quality with AQL. What do we mean by “representative” here? A representative sample is one pulled at random. Sometimes factory staff will collect the best-quality units from production and store them in a specific area, with the aim of directing inspectors to pull samples only from there. But a survey of the residents of one state in the United States isn’t likely to accurately represent the residents of all 50 states. Similarly, you can’t reasonably understand the average quality of your order by only inspecting the units in one specific area of the warehouse. It may be easy to pull all the cartons for your sample from the top of pallets. 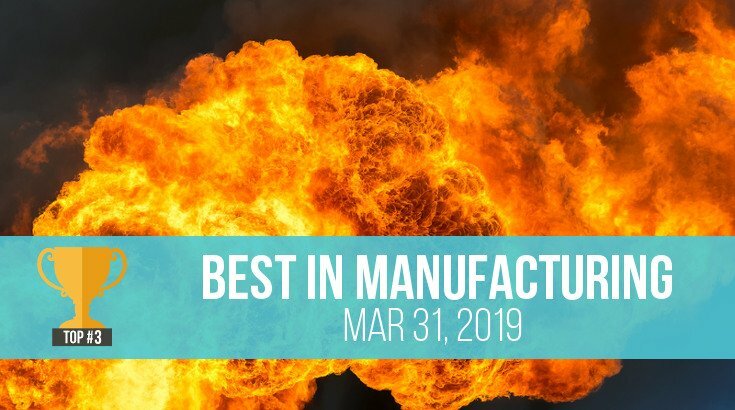 But some factories might try to hide defective products in the bottom and interior areas. Others may have implemented a new production process which has impacted units in the latter part of your order. That’s why QC staff generally don’t pull more than 50 percent of samples from the top. Instead, inspectors should be pulling cartons from the top, bottom, front, back and everywhere in between to get a fair average. In our earlier example of inspecting watches, we found that you’d need to pull a sample size of 125 units for GII inspection. Let’s say there are 25 units in each carton. Would you rather your inspector check all 25 units by pulling just 5 cartons, or spread this sample out over 12 cartons? The latter would be more representative of your whole order. An effective method for calculating the number of cartons to pull from is to take the square root of the total number of cartons, but no fewer than 3 cartons. So if there are only 3 cartons, you’ll pull from all 3 cartons. 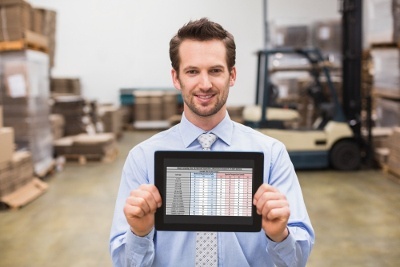 AQL is a can be a very helpful tool in allowing you to inspect your products efficiently. But in order for acceptance sampling to give you reliable results, you need to ensure you’re pulling your samples at random and getting a representative look at your total shipment. Expressing your quality standards in terms of AQL helps you clearly define the scope of inspection that you need. AQL has become the common language that importers, suppliers and QC professionals rely on for evaluating product quality and conformance during product inspection (related: Why QC Professionals Use AQL Sampling for Product Inspection). But many importers struggle to understand how to use the AQL table to determine sample size and acceptable quality levels. And until now, you may have counted yourself among them. Now you know how to follow the AQL chart like a pro. 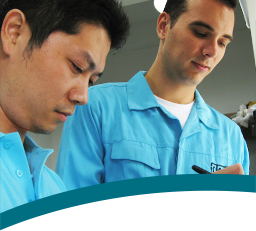 Be sure to include AQLs in the QC checklist you develop with your supplier and quality team. And remember that setting your expectations for quality and other requirements early on is one of the best ways to prevent issues before they occur. Do you want a more in-depth look at how to use the AQL chart? Check out our 9-minute video about how to use AQL for product sampling.